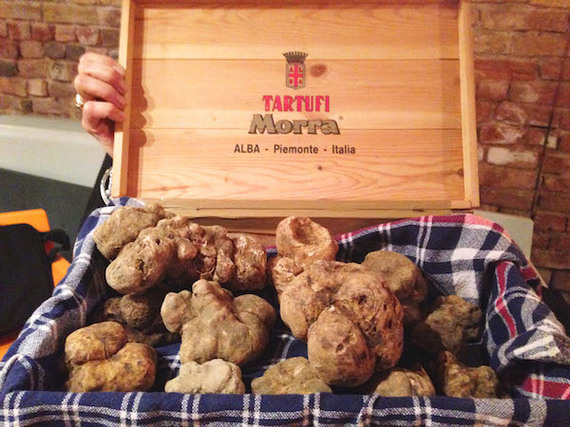 A few weeks ago, I headed up to Alba in search of the tartufo bianco, that coveted white truffle so hidden in the hard dirt of the Langhe region that finding even a small one is like striking gold, the edible kind. In order to prepare for my 72 hours of truffles, I fasted on water and plain yogurt for a week. You see, I knew what to expect, thanks to a jaunt up to the the Fiera del Tartufo a while ago with my friend Charlotte where our naive brains were dulled by the seductive yet suffocatingly sweet scent. In 2006, we were overwhelmed, knew not what to ask, much less eat and spent a few days in a bizarre dolcetto and tartufo haze. This was 2014 and, like I said, I was flavorlessly prepared and had a game plan that consisted of one thing: fresh air. 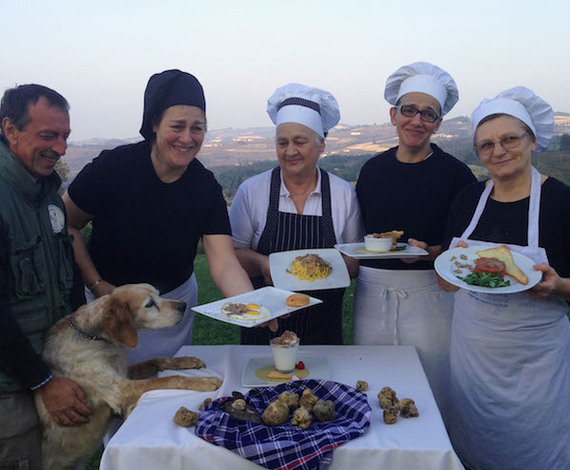 I was going to walk with tartufai, truffle hunters and their dogs, and then grab a dish of tajarin al tartufo, homemade taglierini pasta with shaved truffle. Basta così. I wouldn't get drunk on truffle scent, I wouldn't lose my head to its headiness. My plan worked for a few hours, I spent the morning with Daisy, an amazing Lagotto Romagnolo dog who lived up to her reputation as the best nose in Roddi, the neighborhood where dogs are trained for years in the silent, nocturnal hunt. Her owner Gianpiero told me about cold, brutal evening hunts, pernicious colleagues whose friendly faces hid jealous agenda the minute they talked truffle skills, and life times with dogs who were not trained beasts but thick and thin friends. Gianpiero was a moonlight poet but I forgot every prose the minute I was handed a truffle. Alba's bianco pregiato is a trick. The white truffle is a gnarly, dirty knuckle buried deep beneath compacted dirt which requires concentrated minutes and even hours of excavation that can sometimes lead to disappointment if you get too excited. And it is delicious svengali that makes you believe in you can do anything. Which is kind of true. Add a little shaved truffle to anything -- eggs, melted cheese, fish, raw beef, pasta, gelato -- and you've turned a sow's ear into a silk purse. In those seconds between smelling the truffle and running as fast as I could to the nearest kitchen, I figured out that Alba's fresh October/November air and its glorious green hills invigorate and keep you thinking about the next meal, especially once you smell a truffle. And the next meal is almost a silly concept since every repast is a heavily invested parade of dishes starting with beef tartar followed in quick succession by tajarin, bagna cauda (roasted peppers and anchovies), fonduta (a raclette of melted fontina cheese, egg yellows and shaved truffle), omelette, and gelato al tartufo (a plain cream ice cream with truffle), always accented with glasses of Dolcetto, Nebbiolo, Barolo and Barbaresco. In those quick 72 hours, I waded neck-deep in truffle-accented Albese dishes that I worried I would begin to hate the tuber. I didn't. 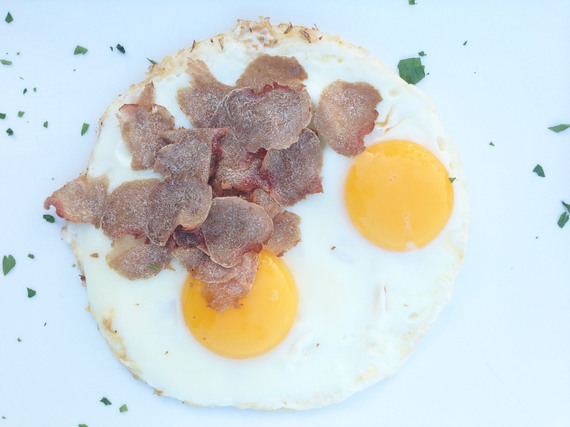 But I did realize that I like the simplest of dishes -- fried eggs with shaved truffle, the bachelor uncle of all dishes, easy to make with a bit of flair. Another truffle hunter agreed with me but said his all time favorite was a late night truffle panino made of thin, alternating layers of slow, oven-baked anchovies and truffles. I'm ready for my next meal. 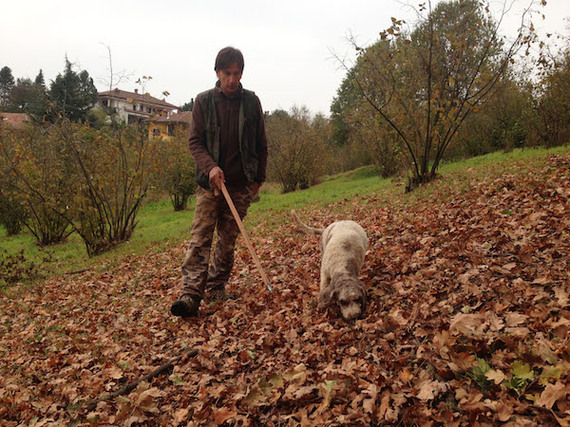 Most of my truffle trivia comes from a long evening at Ca del Lupo and chatting up truffle hunters.